This is a complete step by step guide with a detailed explanation of how to get Big-Eared Ginger Kitten pet in Elder Scrolls Online. You can get it by playing solo or with friends. Is there a way to change your Alliance in Elder Scrolls Online? If yes, how to do it? Find the answers in this detailed guide. Elder Scrolls Online: Summerset is a new chapter of the game. It brings many new quests, territories to explore and new Jewelry crafting profession. ZeniMax created a very unusual system of ESO / PTS uninstallation. Use this guide to properly delete the game from your hard drive. Find out information about housing in ESO, how to buy apartment and decorate them. Furniture crafting and building are also explained. Crown crates are new items in Elder Scrolls Online that can be purchased from ESO in-game Store. When you open it you receive exclusive rewards: items associated with current crate season. Read more about this here. 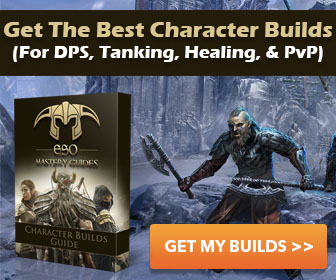 Champion System is a system of passive skills and abilities in Elder Scrolls Online. Learn how to earn Champion Points, how to use and how to reset them. Imperial City Prison is a group dungeon for VR 15-16 players with 5 bosses inside. It will take 60-90 minutes to complete the Prison. All bosses have different mechanics and you will have to play attentively. Tel Var Stones are new “currency” in ESO that can be earned within the Imperial City location only and spent for cool pieces of gear or crafting resources at special trading posts. Soul Gems are special items in Elder Scrolls Online that allow to trap souls of enemies. You can use them for charging weapons and resurrecting allies. Psijic Ambrosia is a drink that can be crafted by Provisioners. When you use it, your character receives 50% more experience from all sources. It’ the only Experience Booster that can be crafted in ESO. Justice System adds a lot of new features to Elder Scrolls Online: you can steal goods and murder NPCs but think twice before doing it. Now all criminal actions lead to punishment if you are caught. Crown Store is in-game shop of Elder Scrolls Online: Tamriel Unlimited. It’s one of the main parts of new ESO Buy to Play (B2P) model. This guide will tell you all information about this new feature. This guide will tell you about how to get Daedric, Ancient Elves, Barbaric, Primal motifs and all other information about styles in Elder Scrolls Online. Dyes allow players to change color of their gear. It’s a new feature and this guide will tell you about how to unlock new colors and apply them to your armor. The Daedric Dolmens are dark portals which Molag Bal’s dark minions summon to use dark anchors to latch his Coldharbour of Oblivion to Tamriel of Nirn. Enchanting is a very difficult to level up. I believe it’s the most difficult profession in ESO. But there are some tips that will help you to level faster. Long Lost Lore is the first quest you will get after joining Mages Guild. This quest will guide you to The Ayleid Ruins of Ondil where you will have great adventures and will receive great rewards. There’s no stealth alternative for a Nightblade within The Elder Scrolls Online, and the game’s main stealth class contains a wide array of skills and abilities to provide players with a heavy dosage of DPS. The Banished Cells are located underground on the second largest of Summerset Isles - Auridon. It is one of the first group dungeons of Aldmeri Dominion. This guide will help you to survive there.